Steve Smith of Australia celebrates his century during day one of the First Test match between Australia and Pakistan at The Gabba on December 15, 2016 in Brisbane, Australia. BRISBANE: Skipper Steve Smith scored a hundred and rookies Matt Renshaw and Peter Handscomb half-centuries as Australia took an early grip on the pink-ball first Test against Pakistan here on Thursday. 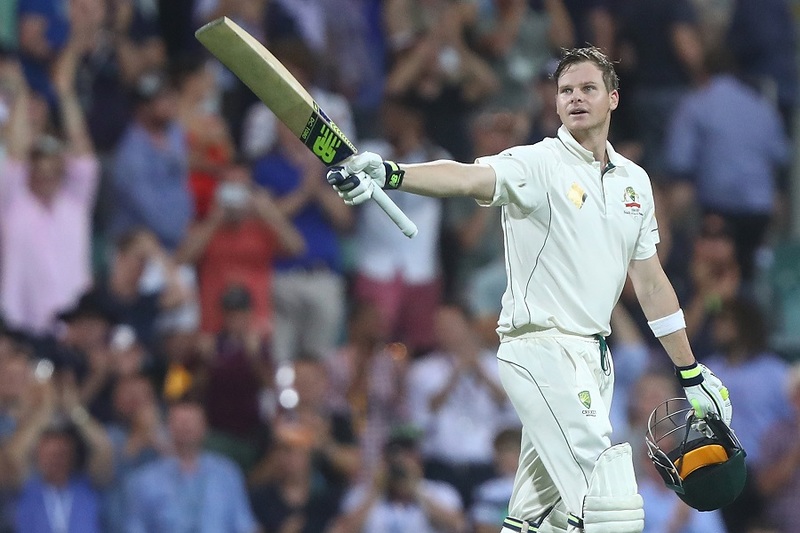 Smith, dropped on 53, showed the way as the Australians built the foundations for a sturdy first innings after winning the toss. At the close before a first day Gabba crowd of more than 26,000, the home side were 288 for three with Smith on 110 and Handscomb, playing in only his second Test match, not out on 64. Smith raised his 16th Test century with a driven four off Mohammad Amir with three overs left in the day. It came off 184 balls with 15 fours. The pair put on an unbroken stand of 137 runs for the fourth wicket after 20-year-old opener Renshaw chipped in with an impressive 71 also playing in his second Test. Smith was put down on 53 nearing the dinner break when an edge off spinner Azhar Ali went in and out of wicketkeeper Sarfraz Ahmed’s gloves. Smith and Handscomb batted through the entire final session when most wickets statistically tumble in pink-ball Tests under the lights to put Australia in a strong position. Pakistan feared they might have lost their star pace bowler Mohammad Amir after he fell to the ground in the final session clutching his right knee after a misfield. Amir jarred his knee after his right leg dug into the turf as the ball ran on to the boundary rope. He was ferried off the ground by a medi-cab, but remarkably returned to the field 30 minutes later and went on to finish the session bowling with the second new ball. It was a huge relief for the tourists after it conjured up memories of England fast bowler Simon Jones rupturing an anterior cruciate ligament in a similar fielding mishap at the Gabba in 2002. “His knee went into the ground and we all feared that he might be worse, but thank God he recovered quickly and he came back,” team-mate Azhar Ali said. “He’s feeling much better and the good thing is that he came on and bowled with the second new ball, which is a good sign.” Australia lost the wicket of Renshaw in the middle session after the dismissals of David Warner and Usman Khawaja in the opening session. Renshaw did not put a foot wrong in an assured innings until the 44th over when he was caught behind off Wahab for 71 off 125 balls with nine fours. The youngster looked at ease in his home ground Test match and was on course for his maiden Test century before Wahab struck. “I’m just enjoying it and trying to go out there and play with a smile on my face because it’s doing something I love, playing for my country,” Renshaw said. “Everyone is disappointed when they get out, but I got 71, it’s my best innings in Test cricket and I was excited to get to 71.” It was reward for Wahab, who was Pakistan’s best performing bowler, maintaining a tight line and conceding few runs. Pakistan struck with two quick wickets in the first session after openers Warner and Renshaw gave Australia a solid start. Amir had Warner leg before wicket for 32 after the Australian vice-captain was struck on the pad on leg stump in the 24th over. Warner was given out by English umpire Ian Gould and did not seek a review, ending an opening stand of 70. Amir is in the first year of his return to international cricket following a five-year ban over spot-fixing, a scandal which almost ended his burgeoning career. Khawaja, coming off his man-of-the-match 145 in last month’s day-night third Test in Adelaide against South Africa, lasted just six balls before he was out to a false stroke to leg-spinner Yasir Shah. Khawaja advanced down the wicket but hit straight into Misbah-ul-Haq’s midriff at short midwicket and was on his way for four.